I am in love with this Emergency Information page. Even though I hope that I will never have to use some of these numbers, keeping them all in one easy-to-reach location really puts my mind at ease. It would also be awesome if you could do a kids' chore page. I've printed a few of these to put on my organization wall and I love the colors. Having all my pages match would be so great! Here are some of my suggestions after many hours of scouring different blogs and ideas; budget sheet, shopping list, monthly/weekly meal plan, family favorite recipes, recipes to try, car maintenance sheets, honey-do list, child sick log, babysitter information. Obviously I don't expect you to do all of these, or any for that matter. Just thoughts on some possibilities. What a great list! You have suggested a few that I had not thought of. I will add them to my list hat I am slowly (but surly) checking off. Hi! 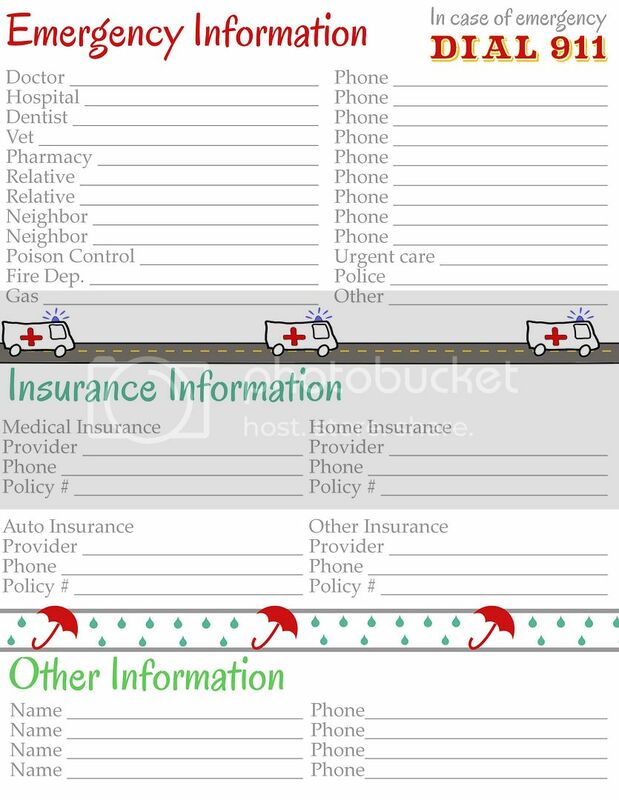 I know that this may not be something alot of people need, but I would love a page to organize all the data on my foster children (birthday, social, insurance number, parents names, caseworker info, etc). If this is something you could do, I'd be happy to tell you what would be great to have on the page. Thanks for providing all of these great printables!! Thanks so much for sharing these great resources! Is there any chance you could do a Aussie version with 000 instead of 911? I'm sure you don't have the time, but thought I'd ask : ) I'll try to cut and paste it. Thanks!